All of the vine and attached items, maple leaves, sunflowers, pumpkins, pine cones and berries, are made of high-quality materials, which are safe and durable. It can be used outside and will not easy to fade or falling off, even under wind, rain or sunshine. This maple garland is flexible enough and can be bent to any shape for your decorating needs. 1. Use to make a maple wreath. 2. Convolve on tables and chairs for Thanksgiving celebrations, fall parties and gatherings to add a strong fall touch. 3. Hang on everywhere at your home, like wall, window, stair banister, fireplace, shelves, cabinets, door frame, door way or other furniture. 4. Cut into smaller pieces to decorate other items, like lantern, computer, vase, lamp and so on. 5. Encircle a basket or vase and add a candle or a bunch of flower to make a simple, elegant centerpiece. 6. Wonderful wedding decoration: place along the red carpet of the aisle or put around the banquet and reception table. 7. Stick on the wall in a heart or square shape to make a unique background for your photos. 8. Perfect decorations for various fall theme occasions: wedding, party, baby shower, the 1st birthday, bridal shower, Thanksgiving dinner, fall harvest, fall yard, and the like. 9. Used as stage props and scene layout for any autumn-themed art projects. 10. Ideal for decorating many places: offices, restaurants, stores, hotels and so on. 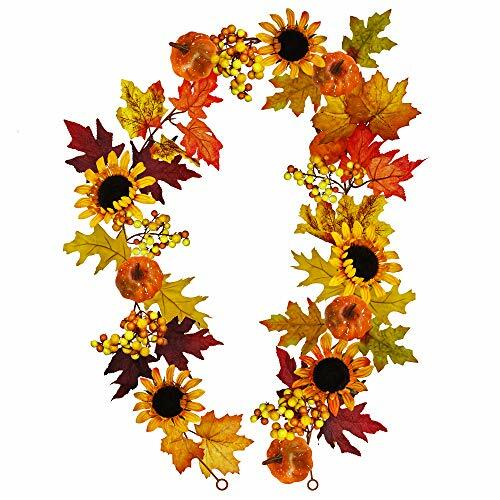 Quantity: 1 PCS Sunflower Maple Leaves Berries fall garland. The maple garland has 26 branches, 52 pcs maple leaves in all. And there are 5 bunches of berries, 5 pieces of sunflowers and 5 pieces of pumpkins on the garland. All of them have lifelike looking and close to nature. Size: The fake hanging vine is approximately 6 feet in length. The maple leaves are in assorted sizes ranging from 2.6 inches to 4.7 inches both in width and length. The berries are approximately 4 inches in length. The sunflowers are approximately 5.5 inches in width. The pumpkins are approximately 2.4 inches in width. Material: The maple leaves are made of silk. Due to the high-quality fabric material, they are light but sturdy, not easy to fade or being ripped, and they can be used inside or outside, even under wind, rain, or sunshine. Furthermore, the maple leaves are not scented and have veins on them. With the vivid look and vibrant colors, this maple garland is a perfect decoration for parties, weddings, stages, offices, restaurants, stores, hotel, banquets, and so on. In addition, it also can be used to decorate anywhere at your home, such as table, mantel, fireplace, door frame, doorway, stair banisters, window, and the like. View More In Artificial Plants & Flowers. If you have any questions about this product by Winlyn, contact us by completing and submitting the form below. If you are looking for a specif part number, please include it with your message.